I don’t often do a retro review but with things being a bit slow at the moment I decided to do a review on an older but still great little model. The NC1 class of racing is either something you love or you hate. Best suited to the twisted and tortuous tracks of home racers, it can be a race winner against faster motors. Having the agility and controllability in the tight inside bends of both board and plastic tracks. 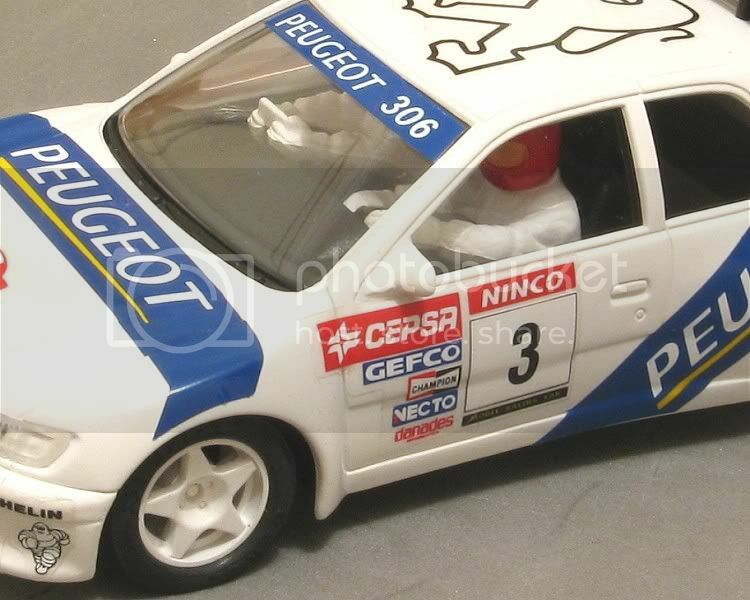 Ninco were also probably singularly responsible for changing the face of home slotcar racing back in the early nineties. 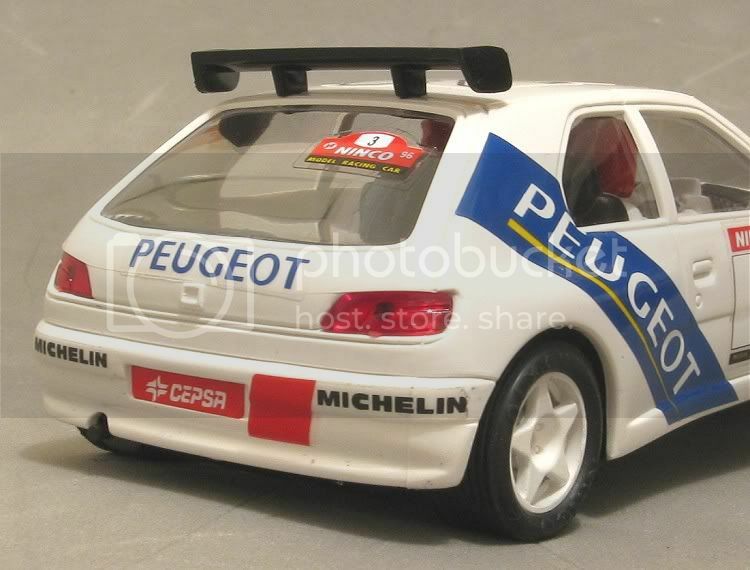 Scalextric were still making models which were frustrating at best. 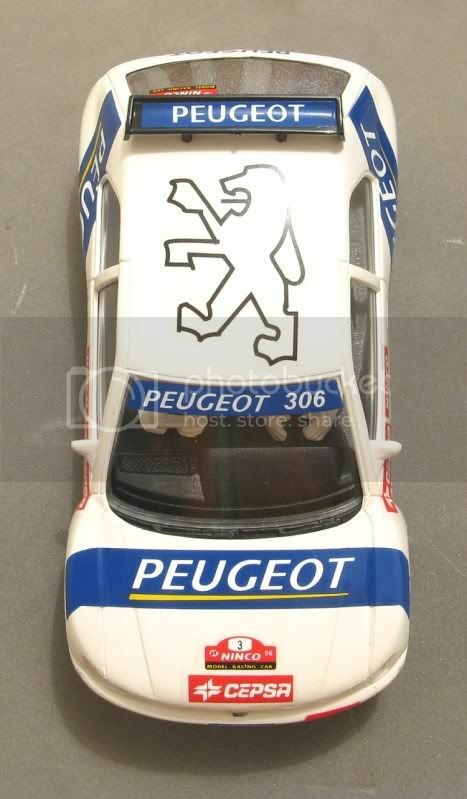 Carrera was still very much a German home market product, and SCX were the closest to making a truly driveable slotcar when Ninco came into being. And in my view we haven’t looked back. The Red team race NC1 Nincos on a regular basis and to date I have been racing a rather aging Renault Megane, which, up ‘til now has been good. But it is slowing and bits are wearing out. The chassis has had two or three repairs and everything is just getting loose in general. Rather than run it into the ground I decided to give it a good scrub down in the washing up bowl and retire it to its crystal display case and put it on display in the display cabinet. The new model was a bit of a chance happening. 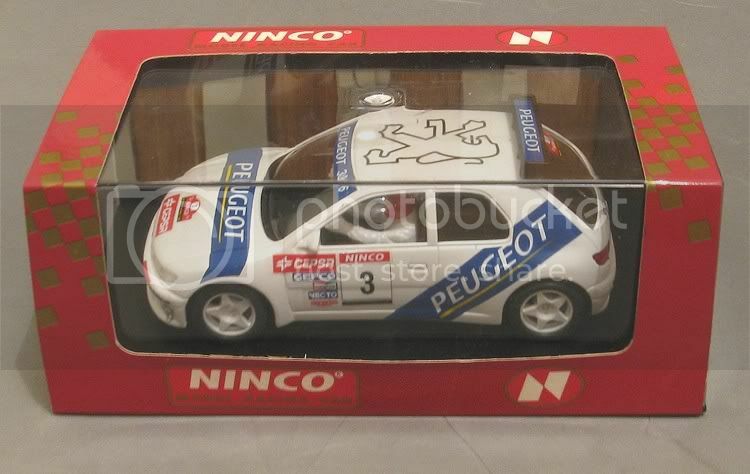 The price of some of the NC1’s can be a bit exorbitant, especially when looking for a mint and boxed example. Then on top of that you have freight, usually from outside Australia, and that puts another premium on top of the cost. Although there are deals to be had, sometimes the more desirable models can approach eighty or ninety dollars by the time the postie has dropped it on your doorstep!! 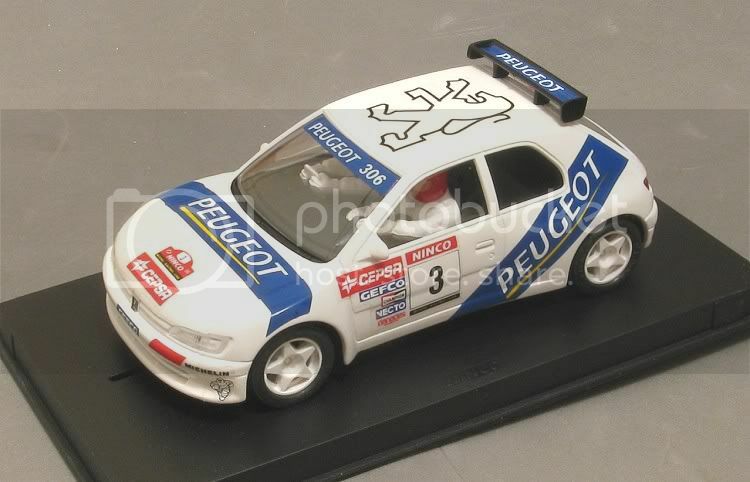 As luck would have it, I had asked Red Team founder member Garry to keep an eye out for a nice NC1 Peugeot 306 on eBay; and if he saw one to acquire it if possible. Days turned into weeks etc. etc. and without one in sight I didn’t give it much more thought. Until fellow Red teamer John mentioned he was going to Sydney for a couple of weeks. Mmmmmmm.. The old grey cells kicked into drive and I recalled seeing some brand new mint and boxed NC1 Nincos at a lesser known Sydney model shop. Sure enough, on his return, it was apparent John had taken some time out and tripped along to Sheriff’s Mini cars. 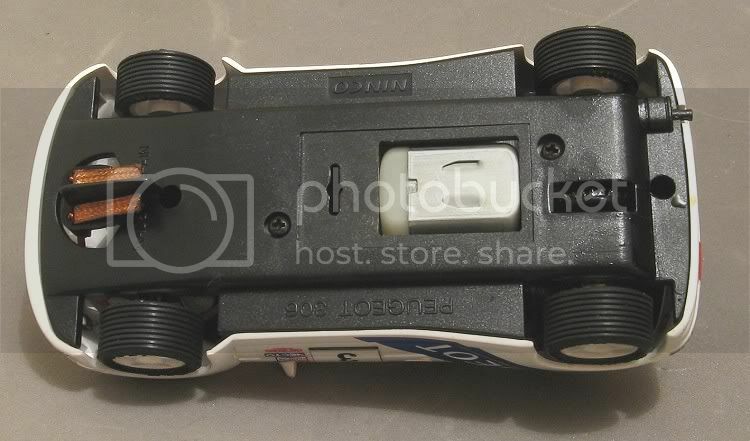 They have been selling mainly diecasts but do have the odd slotcar on the web site and one of their better priced models happened to be the model in question. 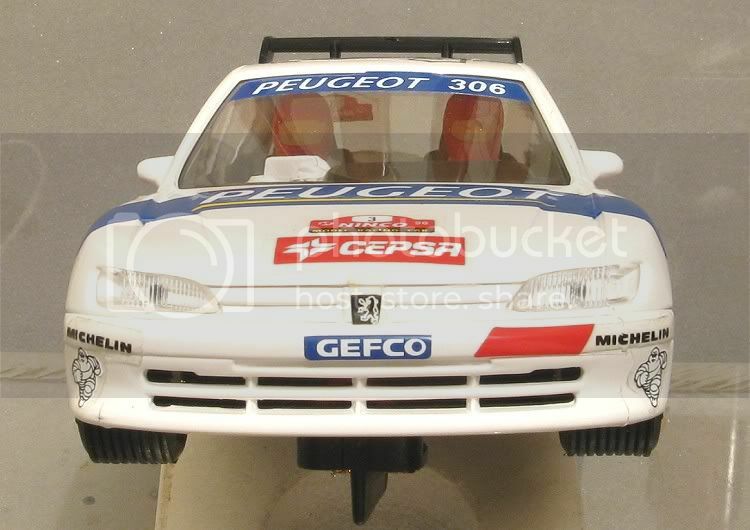 With no freight to pay and almost no waiting, the model was purchased and at the Red Teams next race night I became the proud owner of an immaculate Ninco Peugeot 306. The only downside is that the model was bought for a purpose and that purpose will be fulfilled. 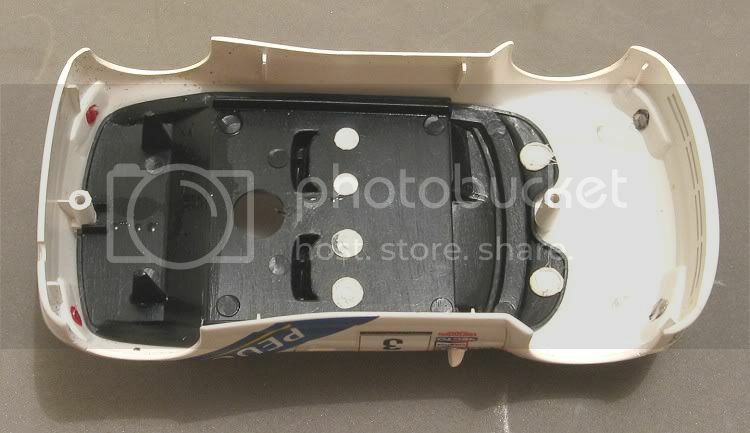 The model was removed from the box and placed on the track. Out of the box it was every bit the model I expected it to be. Not a flash speed machine or multi tampo’d modern slotracer but a rather demure model rally car which, if other examples I have raced are anything to go by, will be every bit as competitive in its class and be the epitome of reliability. So, if you are an SCM, read no further, but if you are someone who likes to run nice models on nice tracks and are want to race ‘out of the box’ models. Follow me. Out of the box the model is very clean and tidy. The models of this era still had self adhesive decals and even from close up it is not that obvious. The chassis is a good snug fit in the body and the interior is simple but effective. Ninco went to the trouble of fitting tinted clear parts for the lights and all the windows are a very good fit in the body. The interior detail is simple and effective with a driver and navigator sitting on a plain black tray. Inside the model we see the bare essentials which made this model so reliable. The motor sits in a tray which can be replaced to upgrade the motor. In this case the motor is an early version of the NC1 without its foil wrapper. The rear axle is quite snug in its brass bushes, but the bushes are a little loose in the chassis. This would need to be fixed if it was to be raced on board tracks. 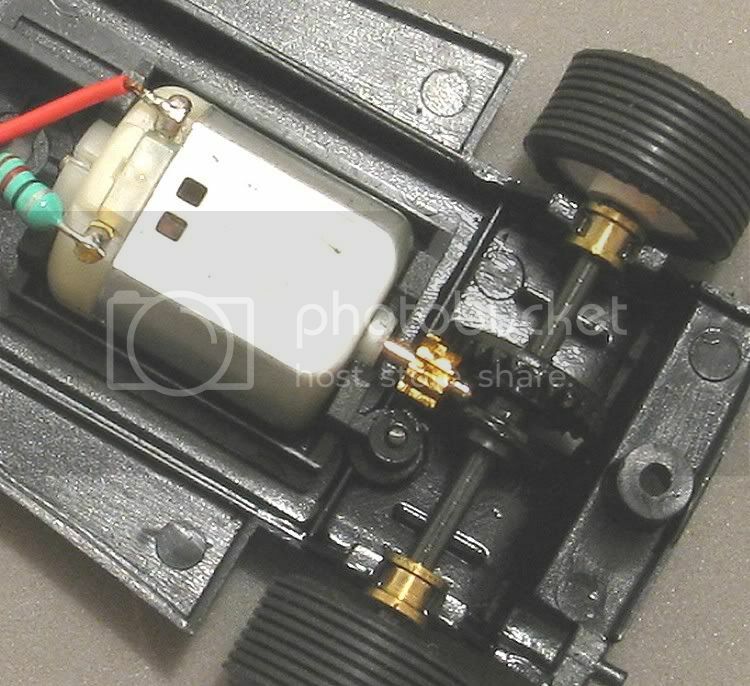 The front axle runs directly in the chassis and as designed, has a little up and down movement. For the more serious racer, Ninco fitted a lot of their early models with just two body mounting screws, making chassis tuning simple. Ninco have always unashamedly created their models a little wider than scale. This was the most contributing factor to their stability in corners. 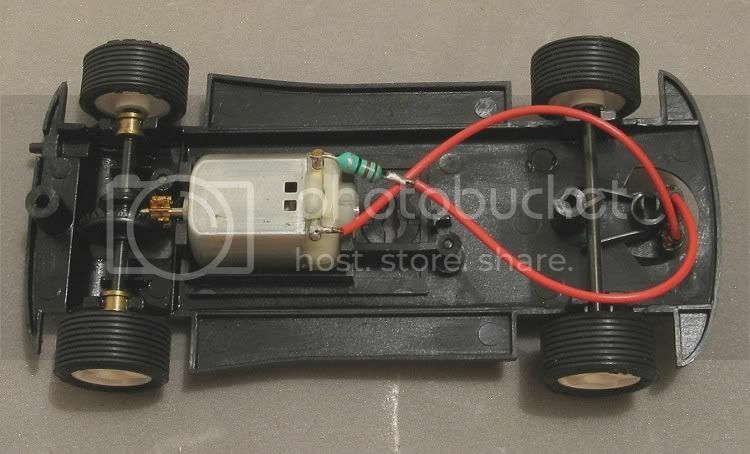 The fact that the front axle is loose is not a big deal when it comes to track stability but on faster tracks I would be inclined to fix it as the model might just need the little extra stability at faster corner entry speeds. A better solution than adding extra weight. Wheels and tyres? Mmmmmmm? The wheels and tyres are from the bad old days, but having said that, the wheels on this model are really quite good. There are little pimples on the wheels were they were attached to the sprue so these will need filling down. Tyres are the ribbed type. I would leave these on the front but fortunately, MJK SCX rally tyres are a good fit for the rears. So what does it drive like? For those who have not driven an NC1 in a race situation I can only recommend that you give it a go. On their own they are a nice well behave model but their forté as a driving pleasure is in competition with like models. Four NC1’s on a small to mid sized track is shear enjoyment. No continual deslotting which fragments race progress, just lap after lap of neck and neck racing until the race finishes. I do not lie when I say I have raced these models in competitions which have seen all competitors cross the finish line within seconds of each other after three minutes racing! 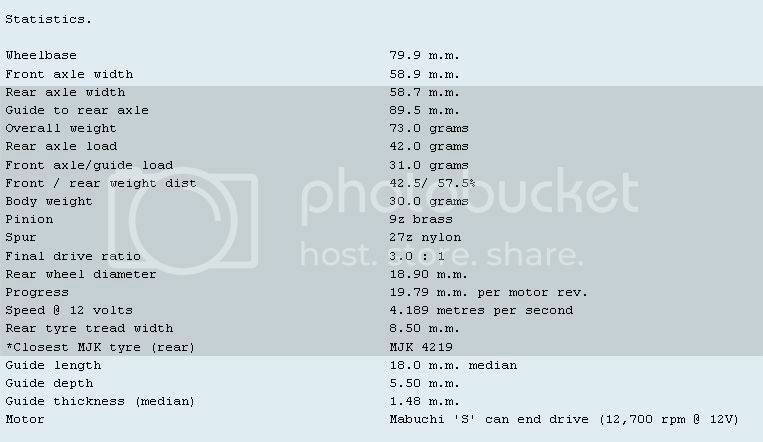 So lets compile some stats to show why this model is so much fun. Make no mistake, one of these on its own is a nice model, and as mentioned before, a race full are a blast, give ‘em a go! 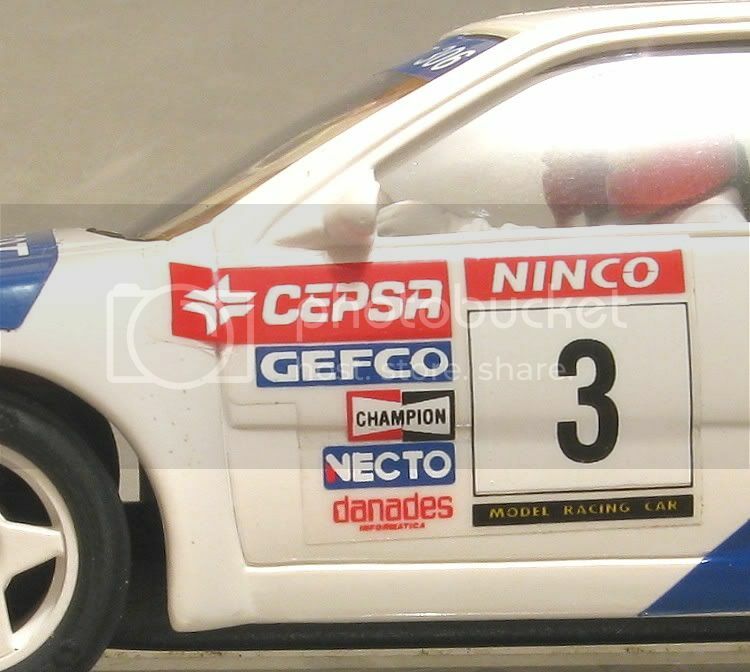 Phil you are dead set right about these early Ninco cars fitted with the best motor ever in the NC1. Why they would ever go away from such a winning package I will not know. But while I was away in th US I managed to visit Cinci Slots and Bruce has a few original NC1 cars available at very good prices. How good you ask? How about an original Porsche GT1 and a Ferrari Rothmans F50 for $40 each! Oh yes come to pappa. Great review by the way.